An overrated filmmaker goes over the top in the very small story of a man who cuts off his arm to save his life. In 2003, Aron Ralston went hiking through the hills and canyons of Utah and got himself into a jam. Crawling through an especially narrow crevice, he slipped and fell -- not far enough to die on impact, but landing in such a way that a boulder, which fell with him, pinned his right arm against the canyon wall. Five days later, he cut off the arm below the elbow, and then climbed and walked until he found someone to take him home. This is a true story, and that's the first problem with 127 Hours, director Danny Boyle's drama of Ralston's ordeal. (The second problem is Danny Boyle, but we'll get to that.) We see plenty of movies based on fact where we know what's going to happen. But those movies have lots of events leading up to whatever they lead up to. 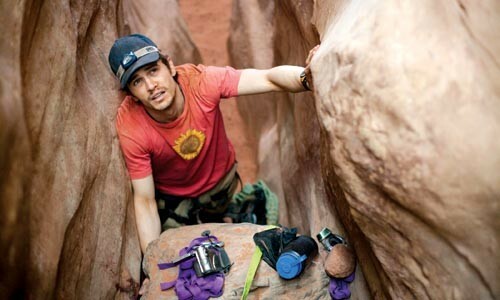 Most of 127 Hours revolves around one character and unfolds with him in isolation. That would be hard for any filmmaker to dramatize, let alone an over-praised hack like Boyle (but we'll get to that). In fact, 127 Hours might have been a compelling movie if someone had thought of it before it actually happened. That might also have saved Ralston -- who has an engineering degree from CMU, and who is played by James Franco -- from what he comes to realize was a foolhardy adventure. Boyle's film has many persuasive moments sprinkled among the many dreary ones. But there probably was no way to make a mainstream film out of a story where nothing happens until it finally does. Boyle (Trainspotting, Slumdog Millionaire) is a noisy, frantic filmmaker, and most of the time, his sound and fury masks the fact that he has nothing to say. 127 Hours begins with some familiar cinematic shorthand: Rather than taking the time to show us who this guy is, Boyle assembles a montage of the fast-paced modern world in which we all live, and from which Ralston (we deduce) wants to escape. It gets the point across, but it's cheap -- anti-drama, anti-character, anti-intellect -- and the music is so loud that it actually tickled my ears. Soon we're in Utah, where Ralston runs into two young women who have lost their way to Blue John Canyon, an especially spectacular attraction. Once they accept that he's not dangerous (it doesn't take long), they hike around together for a while and swim in a gorgeous, isolated pond deep in the canyon. It's all good, and the passageway out is unfettered. 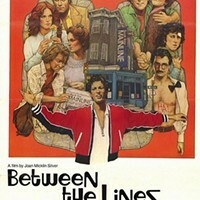 The women depart, and invite him to a party the next night at the motel where they're crashing. He'll know it's them by the big inflated Scooby Doo balloon. On his own now, Ralston hikes deeper and deeper into the canyon. Then comes his slip and fall, and the beginning of his five emotionally rocky days. He tries to cut off his arm after three but can't bring himself to finish the job. Two days later, he does. In between, there are many flashbacks and even premonitions: Ralston with his family, with friends, with a girl, and with -- we suspect when we see it, and later learn -- his as-yet-unborn son. Sometimes the ear-jangling music returns, its volume cranked up, presumably, to indicate some emotional state, and sometimes Boyle uses split screens. 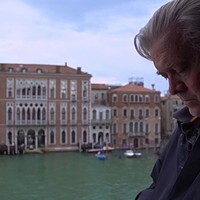 Ralston has a camcorder, and he records messages to his family and, to occupy his mind, some flights of fancy, which Boyle also visualizes. These disparate moments work in spurts, but they never cohere to give the film a point of view. It seems clear after a while that Boyle had neither the insight nor the courage just to let us experience this dilemma with Ralston. How does a man decide to break his own arm and then cut all the way through the flesh and nerves where it's broken? To understand that, we'd need Michael Haneke, not Danny Boyle. As for Franco, he's allowed a wide range of emotions here, and he handles them all well. I think he's a good actor, but I'm positive that he's a charming one, and like most actors who enjoy being brash, he's more compelling when he's not. Franco needs to get out of his comfort zone. Trouble is, he doesn't seem to have one: He's comfortable everywhere. Whether that's the blessing or the curse of his career remains to be seen.